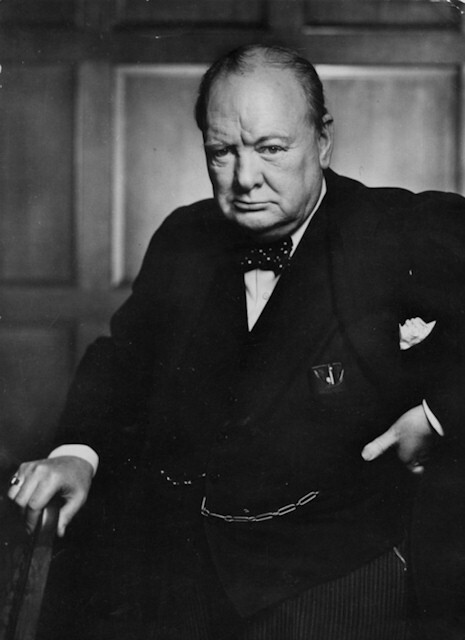 On this day, 70 years ago at 3:40pm, Churchill rose in the House of Commons to report on current war situation. His long speech of that moment would go to history as one of his best: the “We shall fight them on the beaches” speech. Considering the House of Commons being a public forum, Churchill gave an extraordinarily frank description of the events which led to the capital failure of the British Expeditinary Force only a few days previously. It is therefore interesting to include it in its entirety. It has been argued ever since that the British had romanticised the abysmal defeat in France as the “miracle of deliverance”. But clearly, at that very moment Churchill and his government had no illussions as to what the defeat in France had meant for Britain’s further prospects in the war. I have said this armoured scythe-stroke almost reached Dunkirk – almost but not quite. Boulogne and Calais were the scenes of desperate fighting. The Guards defended Boulogne for a while and were then withdrawn by orders from this country. The Rifle Brigade, the 60th Rifles, and the Queen Victoria’s Rifles, with a battalion of British tanks and 1,000 Frenchmen, in all about 4,000 strong, defended Calais to the last. The British Brigadier was given an hour to surrender. He spurned the offer, and four days of intense street fighting passed before silence reigned over Calais, which marked the end of a memorable resistance. Only 30 unwounded survivors were brought off by the Navy and we do not know the fate of their comrades. Their sacrifice, however, was not in vain. At least two armoured divisions, which otherwise would have been turned against the British Expeditionary Force, had to be sent for to overcome them. They have added another page to the glories of the Light Division, and the time gained enabled the Graveline waterlines to be flooded and to be held by the French troops. As mentioned in Churchill’s speech, Calais was a scene of fierce fighting. 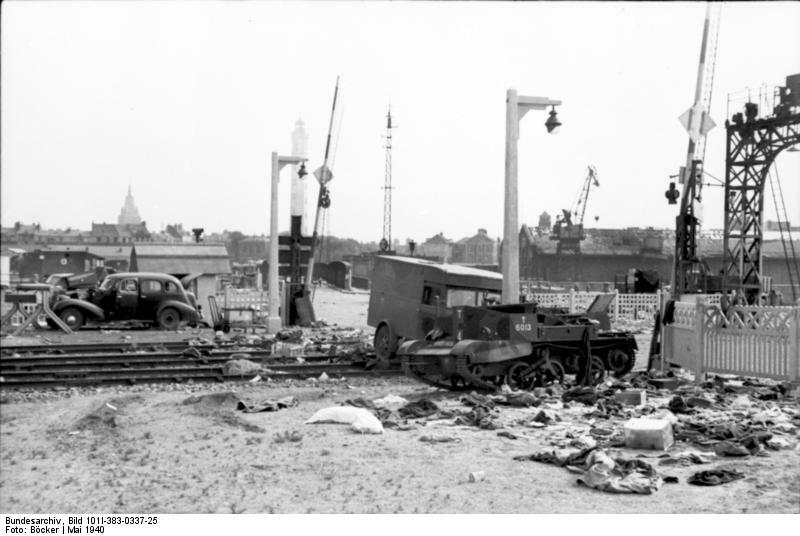 Destroyed British Universal Carrier and other abandoned vehicles in the harbour area. When a week ago today I asked the House to fix this afternoon as the occasion for a statement, I feared it would be my hard lot to announce the greatest military disaster in our long history. I thought – and some good judges agreed with me – that perhaps 20,000 or 30,000 men might be re-embarked. But it certainly seemed that the whole of the French First Army and the whole of the British Expeditionary Force north of the Amiens-Abbeville gap, would be broken up in the open field or else would have to capitulate for lack of food and ammunition. These were the hard and heavy tidings for which I called upon the House and the nation to prepare themselves a week ago. The whole root and core and brain of the British Army, on which and around which we were to build, and are to build, the great British Armies in the later years of the war, seemed about to 789 perish upon the field or to be led into an ignominious and starving captivity. The enemy attacked on all sides with great strength and fierceness, and their main power, the power of their far more numerous air force, was thrown into the battle or else concentrated upon Dunkirk and the beaches. Pressing in upon the narrow exit, both from the east and from the west, the enemy began to fire 790 with cannon upon the beaches by which alone the shipping could approach or depart. They sowed magnetic mines in the channels and seas; they sent repeated waves of hostile aircraft, sometimes more than 100 strong in one formation, to cast their bombs upon the single pier that remained, and upon the sand dunes upon which the troops had their eyes for shelter. Their U-boats, one of which was sunk, and their motor launches took their toll of the vast traffic which now began. For four or five days an intense struggle reigned. All their armoured divisions – or what was left of them – together with great masses of German infantry and artillery, hurled themselves in vain upon the ever-narrowing, ever-contracting appendix within which the British and French Armies fought. Meanwhile, the Royal Navy, with the willing help of countless merchant seamen, strained every nerve to embark the British and Allied troops. Two hundred and twenty light warships and 650 other vessels were engaged. They had to operate upon the difficult coast, often in adverse weather, under an almost ceaseless hail of bombs and an increasing concentration of artillery fire. Nor were the seas, as I have said, themselves free from mines and torpedoes. It was in conditions such as these that our men carried on, with little or no rest, for days and nights on end, making trip after trip across the dangerous waters, bringing with them always men whom they had rescued. The numbers they have brought back are the measure of their devotion and their courage. The hospital ships, which brought off many thousands of British and French wounded, being so plainly marked were a special target for Nazi bombs; but the men and women on board them never faltered in their duty. Meanwhile, the Royal Air Force, which had already been intervening in the battle, so far as its range would allow from home bases, now used part of its main metropolitan fighter strength, and struck at the German bombers, and at the fighters which in large numbers protected them. This struggle was protracted and fierce. Suddenly the scene has cleared, the crash and thunder has for the moment – but only for the moment – died away. A miracle of deliverance, achieved by valour, by perseverance, by perfect discipline, by faultless service, by resource, by skill, by unconquerable fidelity, is manifest to us all. The enemy was hurled back by the retreating British and French troops. He was so roughly handled that he did not harry their departure seriously. The Royal Air Force engaged the main strength of the German Air Force, and inflicted upon them losses of at least four to one; and the Navy, using nearly 1,000 ships of all kinds, carried over 335,000 men, French and British, out of the jaws of death and shame, to their native land and to the tasks which lie immediately ahead. We must be very careful not to assign to this deliverance the attributes of a victory. Wars are not won by evacuations. But there was a victory inside this deliverance, which should be noted. It was gained by the Air Force. Stories of the Battle of Britain 1940 – Where are Replacements to be Found? The lull before heading into the storm of war…. Churchill’s ‘Fight on the beaches’ speech on 4th June 1940, shone light on the underplayed role of the RAF in the Dunkirk evacuation and prepared the country for to the storm they were heading into. With new ‘dunkirk’ spirit we would get through it together, and ‘never surrender’. Having had a closer look at the whole of this speech I was surprised to see that it basically includes a prelude to “the few” speech. Obviously, Churchill saw a need to divert accusations about RAF’s lacking efficiency over Dunkirk. But there is more: a romantic image of young men in powerful deadly machines speeding high above in the sky. “He singled out the RAF partly because of many bitter complaints from the returning troops, who could see little of what was going on, that the ‘Brylcreem boys’ had left them in the lurch, and partly because he knew he would be turning them into particular heroes in the coming weeks. Great to follow your updates – keep them coming! I’m glad to hear that you’ve enjoyed this blog. Having run the BoB theme for a month, I think I’m getting hold of it! Let’s see if we can make other such small discoveries in the future.